How to improve your aim in PlayerUnknown's Battlegrounds. Our PUBG aiming guide explains how to improve your aim whether using a scope at long range or aiming down sights. 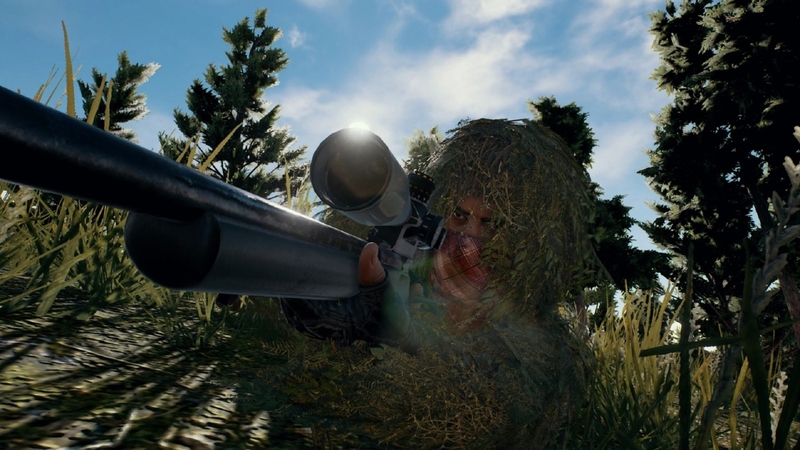 You may be kitted out with all the best gear PUBG has to offer, but you’re not going to get a Chicken Dinner anytime soon without the ability to aim at targets and take them down with relative ease. Part of the trouble with PUBG is that the pace of the game isn’t necessarily conducive to improving your aim, especially as there aren’t any deathmatch servers specifically designed for practicing your shot with a wide variety of guns. The sheer number of guns, attachments, firing modes and recoil patterns can make getting better at aiming pretty unforgiving. A lack of respawns also means you’ll have a very limited opportunity to actually practice shooting enemies in different scenarios before getting taken out. It can take hundreds of rounds before you become more comfortable with all the weapons on offer and start landing your shots, but we’re here to help speed that process up. Below we’ve put together a number of tips and tricks that will help you improve at aiming in PUBG. It’s worth noting that this is the first iteration of our aiming guide and we’ll continue adding tips and tricks as we sink more time into the game. Stay tuned for more very soon! We've based this first section off WackyJacky101's brilliant video which outlines the 4X scope's range finder and how to shoot targets at a variety of distances. 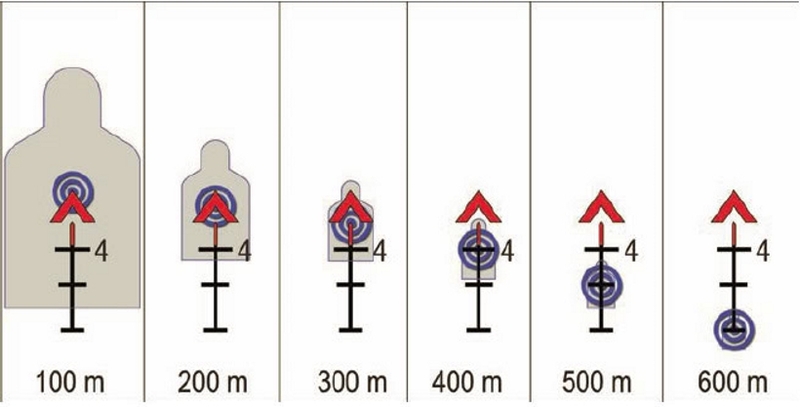 The image below by redditor iamAXO shows exactly how to utilise the scope when shooting enemies at different ranges. This is something the video above illustrates in even great detail, so make sure you give it a watch. 100m - Tip of the chevron. 200m - Bottom of the chevron. 300m - Top of the line. 400m, 500m, 600m - First notch, second notch and third notch on the line respectively. Landing shots on moving targets is one of the trickiest aspects to master in PUBG and something that can be really frustrating, especially if you've got the drop on your opponent, only to start missing all your shots! Again, WackyJacky101's video is a must watch for those looking to improve their aim when shooting targets who are running out in the open. The first thing you'll want to take into account is distance, but how do you calculate how far away your target is when you're under pressure? You can't exactly whip out a ruler, so it's largely up to your own intuition to get this right - the more you play, the more your judgement will improve. When facing a target who's roughly 100m away, imagine there's one person just ahead of them and shoot this position. For opponents 200m away, lead your target by two imaginary people. It's okay if you don't land your first shot, just watch the bullet and adjust your shot slightly! Different guns have different bullet velocities, so this is another variable you'll want to take into account. Of course, the method above works well for every long-range weapon, although you may have to do a little adjusting here and there to land those shots. It’s essential that you get your mouse settings just right. Take into account your DPI rating, mouse acceleration and general sensitivity settings in game to find a balance that’s perfect for you. We highly recommend checking out our best PUBG mouse DPI and sensitivity settings guide for some helpful tips and tricks on this front. This one goes without saying, but practice really does make perfect. Keep playing and you’ll get better over time! Instead of shying away from fights or playing it safe, be aggressive and chase fights when you're trying to work on your aim. Even if you end up losing the vast majority of duels, it’s one of the best ways to improve your rapid fire aiming, and you'll gradually become more comfortable with many of the weapons on offer. Try and have a few quick-fire rounds where you’re actively looking to get into firefights. Land in populated areas like Pochinki, School, Los Leones, Hacienda Del Patron or any other major town or city for some intense action right from the start. Another great way of practicing your aim is to head into Squad matches as a solo player. This way you’ll encounter far more enemies and get involved in more action as a result. Pressing [Shift] when you’re zoomed in with a scope or aiming down sights will temporarily stop your weapon from swaying from side to side. This is great for steadying your shots while firing at targets in the distance, or lining up a headshot from behind. Just keep an eye on the lung capacity meter that appears at the bottom of your HUD when doing so. Once this runs out, you’ll have to wait until it recharges to hold your breath once more. We can’t stress enough the importance of controlling recoil. Whenever you’re about to take a shot, make sure you’re ready for the weapon to kick up or begin swaying to the side. Gradually pull down with the mouse if you’re firing full auto, or be patient with your shots in single fire to avoid whiffing them altogether. At close range we recommend hip-firing, or equipping sights like the Red-Dot or Holographic for a little more precision. This one’s pretty obvious, but you’ll want to use 4X, 8X and 15X Scopes when facing foes at a distance. Don’t be afraid to keep them in your inventory and swap between them to suit the situation at hand! The best players know how to peek properly and it’s something that you should master for a better chance at getting those Chicken Dinners. Pressing [Q] and [E] while aiming down sights will cause you to lean left and right respectively, which is fantastic for peeking around corners or out of cover. Be unpredictable and re-peek corners while firing off a couple of quick shots to put your enemies in a difficult position. Don’t re-peek the same spots every time though! Make your enemy react to your moves and reposition yourself when duelling if you want to catch them off-guard. You'll automatically unscope having fired a bolt-action Sniper Rifle, which means that you'll struggle to see whether your bullet landed anywhere near your target. Stay in scoped mode once you've fired by holding down [LMB] and you'll be able to see where the bullet lands before reloading. This is exceptionally handy at long distances!